Chairman, Council of Economic Analysis of the Prime Minister and the Minister of Finance since January 2018. Research fellow in international macroeconomics and trade at Centre for Economic Policy Research, London and co-director of the Macroeconomics program, Cepremap, Paris. From 2015 to 2016 he was the economic advisor of Emmanuel Macron, Minister of the Economy, Industry and Digital Affairs and worked on the economic program of the candidate during the presidential campaign of 2017. 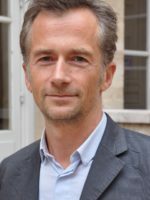 Previously he was the chair of the department of economics at Sciences Po (2008-2013) and has also been employed as a professor at the Paris School of Economics (2000-2008) and the Graduate Institute in Geneva. He was also economist at the Federal Reserve Bank of New York (2001-2002) and has taught at the London School of Economics. He was co-editor of the journal Economic Policy and a consultant for the World Bank and the Banque de France. The Council of Economic Analysis that he chairs is an independent, non-partisan body advising the French Prime Minister, the Minister of Finance as well as the cabinet of the President. He is a member of the 7+7 group of the 14 French and German economists making proposals on the Eurozone reforms. His research concentrates on the fields of international macroeconomics, international finance and trade and has been published in international journals (American Economic Review, Quarterly Journal of Economics, Review of Economic Studies, Journal of International Economics) and books. His latest work in macroeconomics is on the euro crisis and in trade on empirical estimates of trade elasticities. He was a junior member of Institut Universitaire de France and awarded the prize of best French young economist in 2002. He obtained his Diploma from Sciences Po, Paris in 1987, graduated with a master degree in economics from the University Paris-Dauphine in 1988 and earned his Ph.D in Economics from Georgetown University, Washington DC in 1992.